We knew it would come, but somehow a correction is always a surprise after years of a bull market. Current volatility feels so incurable that many media pundits and most planners shake their heads and simply advise you to wait it out. No one can time the market. The Dow performance during the last weeks in August is a case in point. During the week of the 17th, the Dow was down over 11%. Over the next few days, it gained back nearly half of the loss, but by the end of the month, it gave back those gains. Financial behavior experts tell us this volatility is the type of market environment in which irrational decisions based on panic are made. There is an antidote for what seems like a hopelessly tumbling and erratic market... It is a stabilizer which neither zigs nor zags with the market and seems immune to all market forces. Once you have this asset safely tucked away, you are able to calmly see where volatility offers opportunity, what to hold, and what to fold. You can achieve stability in this asset for as little as $5,000-$10,000 to start. In the past month, while the equities markets suffered from whiplash, the rare coin market was steady as a rock. According to the PCGS Key Dates and Rarities index, which tracks the average value of the rare coin market, rare U.S. coins have fluctuated less than 0.5% over the last two months. Protect yourself and you will feel optimistic during dips. With rare coins, you own the most important asset in a downturn; one that gives you the portfolio and emotional ballast to wait out a storm and not make a rash decision you most certainly would regret later. What rare coins should you own to give you the protective effect you need? ASI foresaw the possibility you would need rare tangible assets as an antidote to market swings. We affiliated with Douglas Winter, the world’s leading expert on pre-1933 rare U.S. gold coins, to create the Rare Coin Program (RCP). It has proven to be our most popular rare tangible asset program to date. The Rare Coin Program focuses on three areas we believe are representative of the finest issues the American coin market has to offer. Let’s take a look at each area and learn what goes into our decisions for each. Loosely defined, Proof coins are made specifically for collectors and are struck on special blanks (or ‘planchets’) with multiple blows of the dies. United States gold coins are known to have been produced in a Proof finish dating as far back as the 1820’s, but they were first made in collectible quantities in the late 1850’s. Today, they are extremely popular with collectors and represent the numismatic equivalent of blue chip stocks. 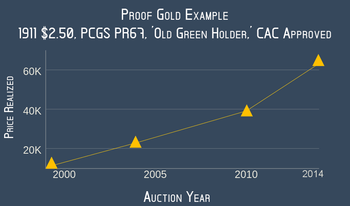 Proof gold coinage is not inexpensive, and significant pieces begin at around $10,000-15,000. But, these coins have significant upside for long-term holds and represent a great way to protect your assets. 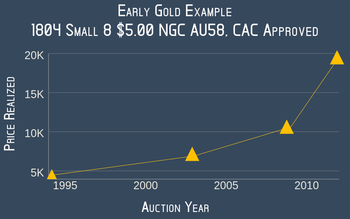 The second area on which the RCP program focuses is early gold coinage. They are better defined as quarter eagles ($2.50 pieces), half eagles ($5.00 pieces), and eagles ($10.00 pieces) struck at the Philadelphia mint between 1795 and 1838. Early gold coinage is popular among collectors, and they have the added value of being regarded as an important historic collectible. Early gold coins begin around $10,000 each, and it is possible to acquire museum-quality pieces in the $25,000-$50,000 range. Branch Mint gold is defined as coins made at mints other than Philadelphia. There were three Southern mints (Charlotte, Dahlonega and New Orleans), and three Western mints (Carson City, Denver and San Francisco). The Southern mints began production in 1838 and continued striking gold coins up until the Civil War, while the Western mints continued into the 20th century. Branch mint gold is the most affordable of the three areas in which we focus. Coins of distinction can be bought for as little as $2,500-5,000 each, and for $10,000 you can own extremely choice and/or numismatically significant pieces in this area. 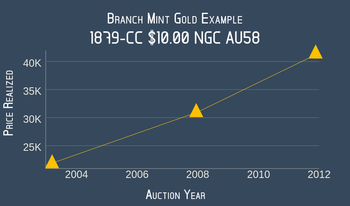 Branch mint gold offers the investor a number of options. You can purchase the best available coins, put together a specialized collection or even buy your ‘hometown’ coins if you are from, say, Atlanta or the San Francisco Bay Area. If you are new to the rare coin market, don’t worry. We are here to help. Getting started in any market can be daunting. With the Rare Coin Program, you have direct access to leading experts in the rare coin market - something you can’t get in other markets. You can’t just call Warren Buffet and ask for stock advice, but you can call ASI and get the best information out there on getting started in the rare coin market. Click here to see some coins we have available for you RIGHT NOW to get started with the RCP. Call us at 800-831-0007 to speak with one of our Preferred Client Relations representatives. We will point you in the right direction. If you already own rare or numismatic coins you would like to sell for an upgrade to the RCP program, we can get you an evaluation and a buyback figure. Take advantage of industry expert access to an asset class that can help you shield yourself from the day to day volatility of major markets!